It’s late in the day but I wanted to squeeze in one Saturday post so I could share the OPI Soft Shades 2016 Collection with you. This white-based, pastel collection in a rainbow of creme shades is quite different from the sheer and sparkly offerings last year (check out those here) but just perfect for Spring and Summer. OPI I Am What I Amethyst is a pale lilac with a slightly thin formula that’s opaque in 2 coats. It has one of the best formulas from the collection and I really just love this slightly grey-toned purplish shade. OPI It’s A Boy! is a pale baby blue that was slightly uneven at first but looks great with 3 coats applied and is completely opaque. OPI One Chic Chick is a pale baby yellow which manages to be opaque with 2 coats although it is a bit uneven. Yellows and pastels are both difficult though, so this is probably one of the better ones I’ve tried in this shade range. OPI Stop I’m Blushing! is a pale pink with a slightly peachy undertone to it. It takes 2 coats for a nearly opaque finish, but it is a bit runny and as a result, uneven. 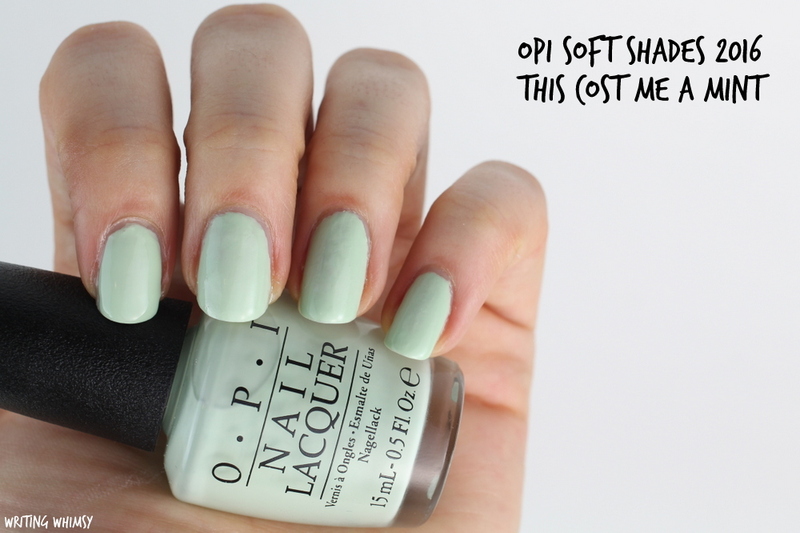 OPI This Cost Me A Mint is a baby grass green with a thin and sheer formula. It doesn’t have the blue tones I expect in a mint, but it is a pretty shade. I used 2 coats but probably should have used a third. OPI It’s in The Cloud is an off-white cream which is opaque in 2 coats, but unfortunately a bit streaky and uneven like so many other white polishes. As much as I love the finished look of most shades in the OPI Soft Shades 2016 Collection, these polishes were definitely more of a struggle to apply than I am used to with OPI. Still, pastels often require 3 coats and if you have a little patience with them it’s still worth grabbing if there’s a shade you love. My personal favourite is definitely OPI I Am What I Amethyst. Do you reach for pastels in the Spring? Do you have a favourite shade from this collection?